- Select Keyway: Schlage (5041S), Best (5041B), Corbin Russwin (5041C), Sargent (5041R), Medeco-Yale (5041M). - 5041 - Combination Entry, Key Override, and Passage: Auto-locking with pass-thru feature. Combination Entrance Combination Chnage from secure (interior) side of door. Meets Department of Defense (DOD) Requirements. 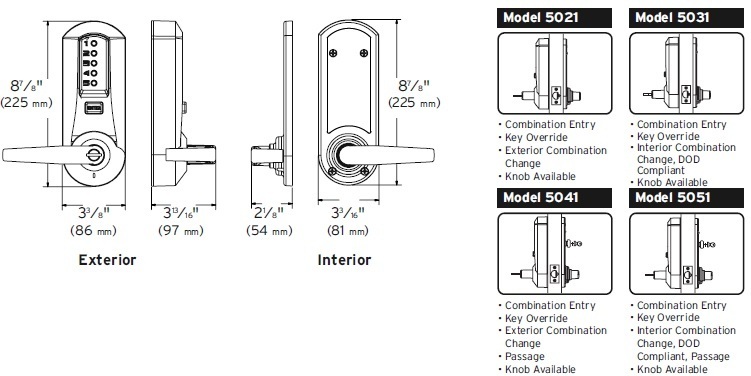 Choose Keyway: Schlage (5041S), Best (5041B), Corbin Russwin (5041C), Sargent (5041R), and Medeco-Yale (5041M).